A truly special picture book. An endearing and reassuring story about Zou’s first night away from his parents. An irresistible tale about the first time a child is away from home overnight… The illustrations are an absolute delight and very engaging for young children… Zou has totally captivated my three year old – she now has a box of kisses by her bed and she requests ‘the little Zou book’ every night. It’s the measure of a good book that after countless reads I’m still enchanted. Humans have a lot to learn from the anthropomorphised animal parents of picture book – from the wise or doting or practical mothers and fathers of Frances the badger, Fiona the pif or Michel Gay’s big-eyed little zebra Zou. Zou is exited about going to holiday camp – until he sees the name tape his mother has sewn on his pyjamas and realises he’ll be sleeping at camp without father or mother to kiss him good night and good morning. So his enterprising parents make him a little box of folded paper kisses to take with him, Dad’s kiss on one side Mum’s lipsticked bow on the other, one for each night and morning and a few spares, just in case. Zou finds that he needs a couple on the train, and at last feels the compulsion to offer one to the inconsolable littlest zebra who is keeping the whole company awake with his sobs. Now everyone wants a paper kiss, and soon Zou has none left, but he falls asleep in the glow of his magnanimous gesture and wakes to a universal friendship that obviates the need for parental symbols of affection. The soft pastel-wash pictures are charming in their greens and greys and zebra stripes and their focus on little faces full of expression, particularly the sequence depicting Zou’s struggle with his conscience over whether he can sacrifice one of his precious kisses to the needs of the sad little stranger. Along with the absolute simplicity of the text, this concentration on little stripy faces and the feelings they display saves for sheer enjoyment a concept that could easily have been both saccharine and somewhat preachy. The little zebra, Zou, is back. He’s now old enough to step out on his own, joining a trainload of young zebras on an overnight train trip to the beach where they will spend the weekend. It’s his first time away from home and while the idea may be appealing the reality of leaving Mum and Dad on the station platform is not. Fortunately his mother has had the brilliant idea of producing lots of little pieces of paper on the side of which she plants a kiss while Dad does the same on the other. The box full of kisses not only sees Zou survive the trip but helps an even smaller zebra as well – and makes a lot of friends for Zou. Michel Gay’s illustrations bridge the gap between the human and zebra elements of the tale to create a heart-warming allegory of children’s good intentions and parental understanding. Zou and the Box of Kisses was first published in French by L’ecole des Loisirs in Paris in 2008. Often when children are away from their parents for the first time they are frightened, upset and may worry that they have lost their parents love. This is indeed the experience of Zou, a young zebra about to go off to a holiday camp. Although his parents are helping him to prepare for camp and he’s excited, Zou is also worried about being away from his parents. To help reassure him Zou’s mum and dad create a reminder of their love for him that he can take to camp. Sometimes a child will need to live away from their parents, in order to be safe. For such children, we need to help them remember that although the circumstances might be complicated generally their parents and families will still love them. Zou and the Box of Kisses is a fantastic example of how parents can reassure their children when they come into care. Zou the baby zebra is going to spend his first night away from his parents when he goes off to camp, an although he is excited about his upcoming adventure he is worried about how he will cope being away from Mum and Dad and their morning and night-time kisses. This is a warm and delightful story about a young child making big steps into independence, with the gentle love and compassion of some very resourceful, imaginative parents. Zou is an endearing and delightful character. He is warm and honest, and through helping others he unwittingly helps himself. His empathy and selflessness are the kind of traits any parent would want for their child. The illustration is friendly, descriptive and character-driven, without too much fuss; perfect for the three to seven year age group this title is aimed at. Gay addresses a potentially scary scenario for young children with tact and kindness. He is never cloying or sweet. This story would be a welcome addition to any home collection – especially in zebra-loving households, such as my own. This is a really cute story about kisses. Zou (a zebra) is getting ready to go on a school camp. The trouble is he doesn’t know how he’s going to cope without kisses from his mum and dad. He doesn’t want to look like a baby so his mum and dad come up with a great idea. They fill a box with kisses so Zou can get one out whenever he feels like it. However, once on the train Zou is amazed at what happens with his box of kisses. A lovely little story for ages 4 plus. Zou, a little zebra, is worried about going on school camp as he will miss his mum and dad. But his wise parents pack him a box of kisses, small pieces of paper which his mum and dad have kissed. He has one for each night and one for each morning and a few to spare. But on the first night, Zou shares his kisses with a little zebra that is badly missing its mum and dad. Then the other little zebras each want a ‘lolly kiss’. Soon there are none left but Zou has made lots of friends and is too excited about the camp to miss his parents. This is an endearing picture book about Zou’s first night away from his parents. It is reassuring that he finds he can cope on his own. 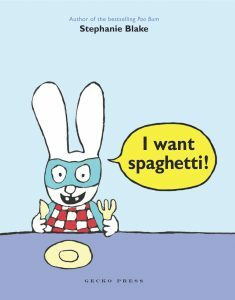 This is a heart-warming story for children from kinder age, and would be great fun to read aloud. Zou the Zebra is excited about holiday camp, until he realises there will be no good morning and goodnight kisses from Dad and Mum. Zou’s parents decide to make their little zebra some kisses to take with him to camp. Dad cuts up pieces of paper and he and Mum kiss each one, with Mum’s kisses being imprints of her bright red lipstick. The paper kisses are placed in a little red box, which Zou clings to as he farewells his parents at the railway station. On the camp train, Zou realises there are other little zebras missing their parents, and he knows his paper kisses will help them feel better too. Michel Gay has expertly explored the theme of separation anxiety, with the lightest of touches and not a suggestion of sentimentality. His monochromatic illustrations highlight Zou’s bright red box of kisses, suggesting that a reminder from home can bring colour to an otherwise grey day. Recommended for 2.5 to 6 years. 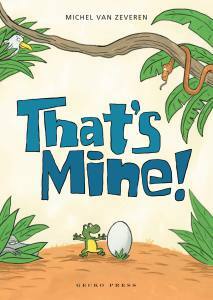 If your child is the one in a million who doesn’t have sharing issues, then this delightful picture book may not be top of your reading list. But the rest of us will say a big merci to French author Michel Gay (this edition is translated by Linda Burgess). Zou is a little zebra about to go on school camp for the first time. He’s excited – until he sees his mother packing his pyjamas, and realises his parents won’t be coming along. So they make him a box of kisses – pieces of folded paper with dad’s kiss on one side and mum’s lipstick smacker on the other – one for every night of camp. But Zou isn’t the only young zebra on the bus struggling with separation anxiety, and what unfolds is a wonderfully warm story that never fails to make Syd smile. Zou is the cutest baby zebra … he has big brown eyes and wears little yellow shorts. He is off on his first overnight camp with school, but he’s scared. Although he doesn’t want to appear a baby, he is going to miss his mummy and daddy. But Mummy and Daddy zebra know just what to do. This is such a feel-good book. 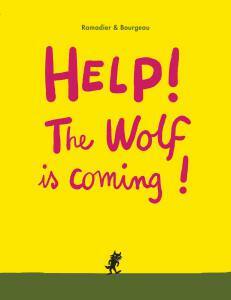 It’s endearing, warm and a lovely child-centred story. 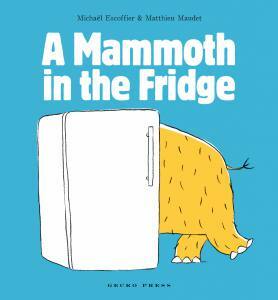 It has delightful illustrations and is great to read aloud with your little one wrapped in your arms. Zou is preparing to leave for a school camp. He doesn’t want to seem like a baby, but he knows he will miss his parents’ daily kisses. Zou needn’t worry because Mum and Dad have a solution. They make dozens of paper kisses and put them in a box for Zou to use when he feels lonely. The box of kisses proves to be surprisingly useful on the train and Zou forgets his fear and sadness when he helps other little zebras. 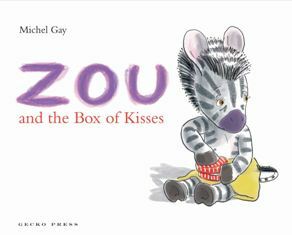 Zou and the Box of Kisses, by French author and illustrator Michel Gay, is a warm story about the anxiety children experience when they are separated from their parents. ‘This book makes you remember exactly what it was like to be on your own for the first time,’ says Gecko Press director Julia Marshall. The colour picture book is a follow-up to Zou and suitable for children aged four years and older. 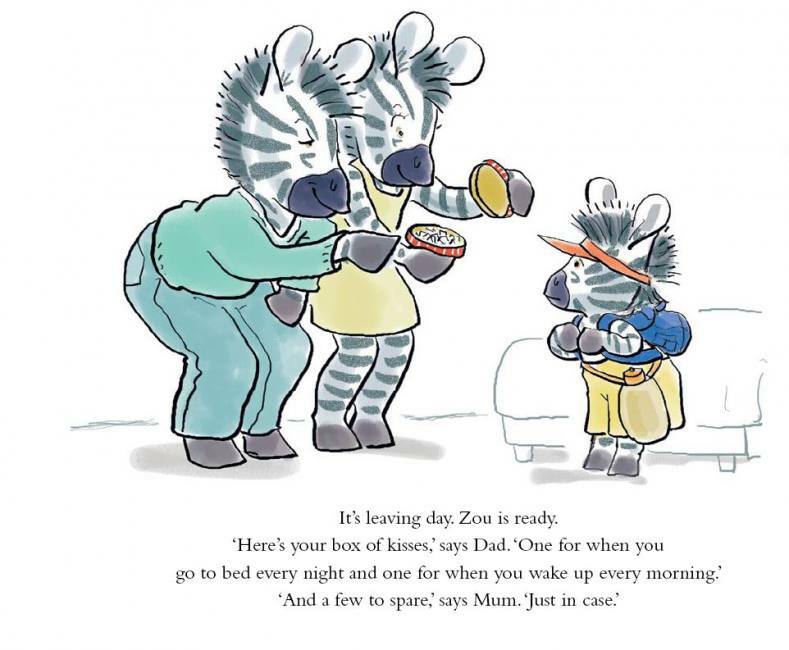 Zou and the Box of Kisses, features a young zebra who is going on his first camp. His parents gently encourage him to try new experiences away from home. Supportive adults and friends help Zou to step outside his comfort zone. The ‘growing up’ theme is developed with insight into youngsters’ anxieties about sleepovers. The author’s soft-coloured illustrations stand out on the white pages, drawing attention to the expressive Zou. A heart-warming story. Little zebra Zou is is off to camp. When he realises he’s going to be sleeping away from his parents, without their good night and good morning kisses, he feels reluctant and worried. So his parents make him a box of folded-up pieces of paper on which they’ve imprinted a kiss. Sure enough, Zou feels sad on the train and uses just one kiss, but when he hears another little zebra crying for his parents, he offers him a paper kiss too. Soon even the bigger zebras want a paper kiss. Come morning, Zou has a whole lot of new friends. Problem solved. Easy. Soft illustrations add to the reassuring feel, with the zebras in muted greys rather than stark black-and-white. Originally released in France in 2008, Zou and the Box of Kisses is published here by Gecko Press, which specialises in translating ‘curiously good’ children’s books from other languages. Best for parents wanting to address the issue of separation anxiety. It’s an exciting time for Zou, he’s going away to holiday camp with all the other little zebras. He tests out all his gear the day before. However, when he sees that his mum has sewn his name into his pyjamas he realises his parents won’t be going with him. Mum and Dad have a cunning plan: they make a box of kisses for Zou to take with him, so he can have a kiss from them any time he needs one. Little does Zou know just how many kisses will be needed. In this fabulous story tackling one of the biggest challenges for small children – separation – Zou learns that he’s not alone in his distress at leaving his parents and that kindness can help everyone. The illustrations are lovely and the soft grey tones of the zebras (and surrounds) make the red and white striped box of kisses stand out. The sorry is reassuring for little ones and very easy for them to relate to. It provides plenty of opportunity for parents to discuss with children the issues of separation, kindness and friendship. Zou is off to camp but he’s worried he will miss all his daily kisses. So Mum and Dad make dozens of paper kisses and put them in a box for Zou to use whenever he feels a bit lonely. But the box of kisses comes in surprisingly useful on the train journey. An adorable sequel to Zou, this is a reassuring story about friendship and being away from your family for the first time. Other themes include empathy and comfort so, when Zou helps the other children, he forgets his own fear and sadness. 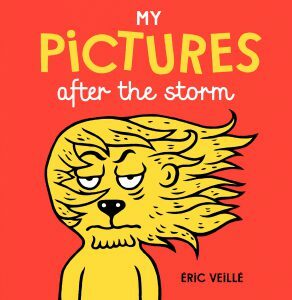 Translated from French, it is perfect for children aged 3 plus. Zou is off to holiday camp but as the time comes near to leave he is not so sure he really wants to go. Mother and Dad Zebra however come up with a perfect solution and give him a small box in which they have put some papers with their kisses (Mother’s in brilliant lipstick red) for him to take out when he is sad. Zou, being a really lovely little zebra, shares the kisses with other homesick campers on the train and then discovers, once they arrive at camp, he no longer needs them. There is just one word to describe this book – it’s charming from the expressions on the animals’ faces to the non-cloying, warm messages it gives. paper kisses and put them in a box for Zou to use whenever he feels a bit lonely. little zebras – with a bit of help from a lot of kisses! When Zou sees his mother sewing on name tapes, the reality of sleeping away from home suddenly hits him. ”Don’t worry,’ said Dad. 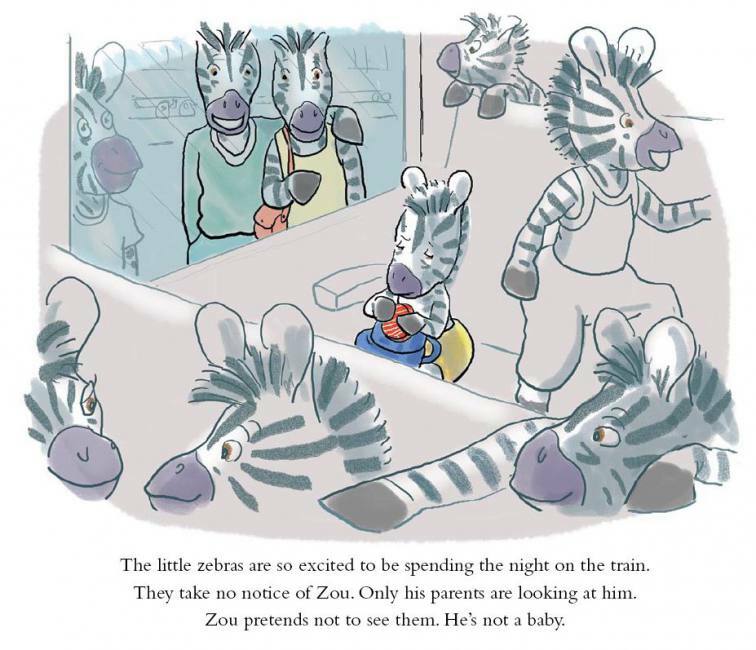 ‘We’ll make a box of kisses you can take with you.” When the little zebras are on the train, some of them are sad – but Zou has the answer. Through sharing, he makes lots of new friends and doesn’t have time to miss mum and dad. This endearing story about a zebra will reassure all children about to stay away for the first time and it would be lovely to share this with your child well in advance so they too can be reassured – staying away for the first time is a real milestone in children’s lives and this book will help to make it a positive experience. It helps parents, too, to empathise with their child’s feelings.The illustrations are soft and beautifully express the feelings of the zebras. This is a simple but lovely feel good story about a little zebra going off to school camp and not realising the implications that this would mean separation from parents. He doesn’t want to seem as if he isn’t big and independent but will definitely miss his parents and so they come up with a solution where they give him a little box of kisses (on paper) from Mum and Dad. On the train he’s feeling a bit sad but in a surprising turnaround he finds a littler zebra very upset about being separated from his parents and in desperate need of comfort. Zou bravely realises his comforting tool could be put to better use sharing with all the other zebras and not only does he forget his own worries, he helps others and in the process makes a whole lot of new friends. This story is a great reminder that kind acts do get rewarded, that bravery comes in different forms and that children and parents both can be strong and cope when away for short trips from their precious family although I am definitely not yet ready for that with my precious toddler!